After six weeks on the road, we are back in New Orleans for a few days before returning to California until the fall. Although a whirlwind visit, I settle in with that same feeling I get when meeting up with an old friend after years apart, picking up where we left off with the comfort that comes from familiarity. 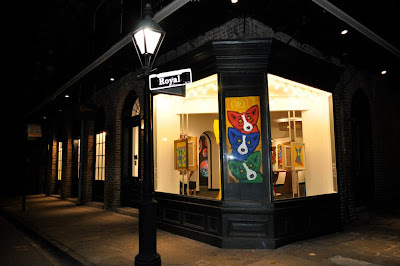 As George checked on his new gallery and hung his new paintings, I drove through the French Quarter yesterday on my way to a meeting (okay, a much-needed hair appointment). I noticed the architecture, the hanging ferns, and the decorated bicycle baskets, realizing now that after long periods here, I forget to see. Perhaps the time away serves a purpose more important and less indulgent than escaping the heat. We’ve been away from the city for a while, and so maybe this fifth year Katrina anniversary is a topic of everyday conversation without our knowing it. However to us, after seeing friends and running errands, the buzz is vocally absent. It’s on everyone’s mind, in the face of every person I see, but evidently for many, that’s enough. There is nothing to be gained in rehashing the pain, even though it lingers in the background of conversations, an anniversary not worth celebrating, agonizing to remember, desired, but impossible, to forget. We can’t see the Mississippi River from our back porch. But the tops of the ships and barges float by as though drifting along the rooftops, warehouses, and levees so that, even several blocks away, we know the water’s there. I think people visit New Orleans and forget about the river, a presence so ingrained in the local population that, like Katrina, it flows subconsciously behind every thought. The river is the reason for this city’s existence, the reason for a purchase adding fourteen states to our country, the source of Tom Sawyer and “Ol’ Man River,” the front yard to Oak Alley and Houmas House (pictured), the division between East and West Bank. My mother, Mignon McClanahan Wolfe, grew up in Algiers on the West Bank and rode the ferry across the Mississippi River everyday to New Orleans, where she attended Rugby Academy in the 1950s. I hardly recognize her, a true 'sashay-by' New Orleans lady, in the military uniform of the formerly all-boy’s school. My uncle, Jack McClanahan, her younger brother, met her at the ferry landing after school, and together they raced to the hot tamale stand before heading into the double feature, a routine they followed for years until they were banned from the movie for draping their gooey hot tamale wrappers along the theater’s back row of seats. (Ironically, this fun wouldn’t have lasted much longer anyway after the vendor’s owner was arrested for killing and making use of the neighborhood cats). I’ve never ridden on the ferry. I sat in bridge traffic for years, however, before they doubled the size of the Crescent City Connection, making me (and a lot of other people) late for nearly everything. I remember panicking after leaving class uptown on Friday afternoons that I wouldn’t make my 6 PM Bertucci’s dinner date in Harvey with Grandma Helen, who I found many times in her Gretna home, already in her nightgown and fast asleep by 7:00. As we traveled following September 2005, more people than I can count asked us why we would stay after Katrina. Even more wondered, Why live in New Orleans at all? Like many people when it comes to home, we can’t help it. New Orleans is the kind of place that inspires sentimental moods, that embraces reminiscences. Even better, the memory-making experiences just keep coming, with outstanding cuisine, art exhibitions, Mardi Gras, music and more. 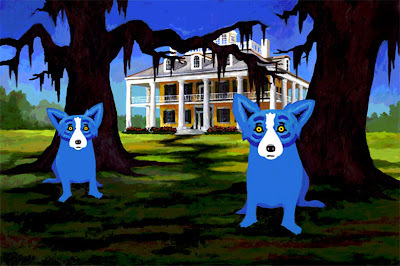 In case you missed it in April, our story and George Rodrigue's photographs following Katrina are here. 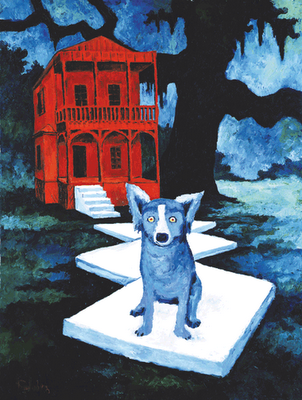 For a look at paintings following Katrina, see the post "Blue Dog: The Dark Period"
Aaaah, Wendy, there is nothing like a metal roof and an afternoon thunderstorm, and a nice, soft pillow. The three things go together like ... (insert your other favorite South Louisiana necessities!) (Metal roof optional, of course, but highly desirable) Thanks for the wonderful memories of growing up in South Louisiana. You paint beautiful scenery with your words!!! Saundra -- You are always welcome to visit! Jodie -- You're right. If we really tried to explain it, we'd be explaining for the rest of our lives. When I was a little boy, I lived on the west bank and we rode the ferry quite frequently. There is something about the roar of its engine, the way the ferry crew positions and docks the boat, the smell of the river and the diesel fuel and the swirls in the water as it crosses the river. I take a ride across and back each time I visit and feel 7 again!